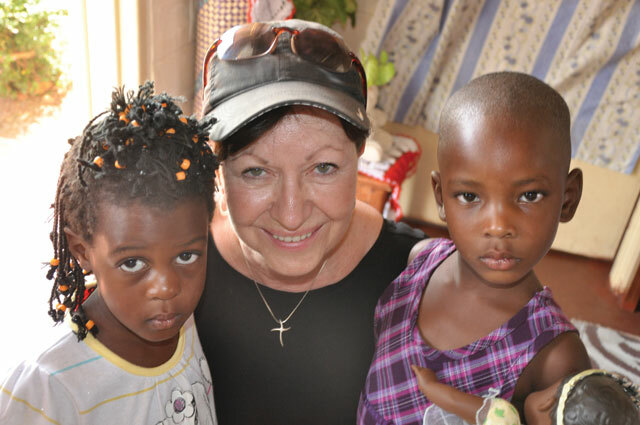 Steve and Linda Kovacs of Waterscene joined 23 others, including a group of 19 from Aquascape, and a team from H2O4All on another annual humanitarian trip to Uganda, where they installed a rainwater collection system. Existing wells, lakes and water reservoirs are becoming contaminated. The only hope for these communities is to provide new access to fresh water supplies. The team completed a system in the orphan village of Gulu, then traveled to Kiyindi, a small fishing village near the shores of Lake Victoria. Here, they set up a 20,000 gallon RainXchange™ system that will support a school of 950 children. During the dry season, the school sometimes has no water at all and is forced to close down because there is no water to cook the nutritional meal that the students count on. Existing water supplies have become contaminated, and new wells are expensive to construct. Rainwater collection systems are effective and much less costly than building new wells. The team worked alongside locals to help build and install the system. Working with Aquascape contractors and International Network, we installed a reservoir made up of 650 Aquablox® that stabilized a large reservoir that can hold about 80,000 liters of rainwater. The contractors, experienced in working with these systems, raised their individual funds to be part of the trip. During construction, and with our consulting support, the community gained enough knowledge and expertise to maintain the system for long-term use. Arriving in the heat of the area’s mid-summer season (January-February), we encountered some challenges getting supplies through customs but the officials complied quickly and we were underway. A project that would typically take 7 days to install was completed in just 4 days! When the project was completed and the water turned on, H2O4All’s ionization system delivered sparkling clean water. As the area had been going through a drought, it was highly rewarding to test the system and see the fresh water flowing from the pipe. Team members also assisted by spending time in schools working with the children. Villages in Africa face a daunting threat as water supplies are rapidly being contaminated with chemicals like cyanide and lead due to poor well design. In some cases, entire communities are forced to abandon their homes as the village water supply turns deadly. Lakes, too, have become heavily polluted. Rainwater harvesting systems provide a sustainable, solar-powered supply of fresh water. Humanitarian water projects like this one are important to help these communities.